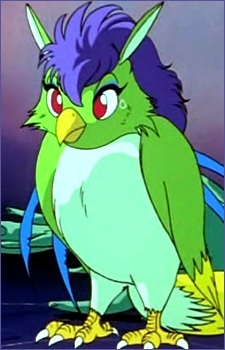 Murugu is the annoying bird that Suzaku owns. She is like a spy for Maze Castle, and gives Suzaku information whenever he asks it of her. Murugu apparently has the ability to pass through the barrier containing both Maze Castle and the demon city as well as travel between the human and demon realms, as it was she who first informed Suzaku of Keiko when he sent her to gather information on Yusuke. She is very loyal to Suzaku, and only follows his orders. Murugu was ultimately killed along with her master when Yusuke's final attack destroyed both of them, The Makai whistle, and much of Suzaku's tower.